Mozambique's relief agency, the Institute of natural Disaster Management, (INGC) says it is preparing to deal with a tropical cyclone which is set to make landfall over the coast by Monday. The Technical Council for Disaster Management (CTGC) met on Friday in Maputo to draw up a contingency plan for the low pressure system formed in the Mozambique Channel, which could evolve into a tropical depression, affecting the central and northern regions of the country. 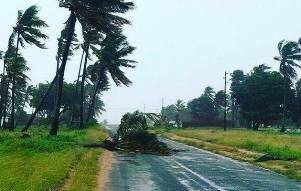 "The low pressure system will affect the coast of Nampula and Zambezia provinces with very heavy rains, accompanied by severe winds and thunderstorms" CTGC said in a media statement emailed to APA on Friday. Accoring to GTGC, the forecast is based on information provided by the National Institute of Meteorology (INAM). It is estimated that precipitation could reach between 100 and 200 millimeters in 24 hours while southern Zimbabwe and eastern Botswana may well benefit from remnant thundery rain. Also in the central and northern regions, moderate and locally very heavy rains are expected to occur on the same day, mainly in the provinces of Tete and Niassa, where precipitation may reach between 50 and 100 millimeters in 12 hours. The phenomenon will affect the basins of the rivers Messalo, Megaruma, Mecuburi, Meluli, Ligonha and Licungo, affecting the districts of Nacaroa, Moche, Angoche, Pebane, Mocuba, Namacurra, Lugela and Maganja da Costa. The director general of the National Institute for Disaster Management (INGC), João Machatine, said that in order to avoid greater damage, it is urgent to design a sector response plan for this phenomenon that has a high potential to cause loss of life and destroy infrastructure. "It's time to take action to prevent further damage by positioning resources. We have to find alternatives to ensure the movement of people and goods. We will move mobile platforms to Mocuba to ensure the crossing of the main roads, "said Munguambe. The plan should ensure the arrival of material from the education sector so as not to jeopardize the start of the school year, medicines, shelter for people who may be affected, removal of the affected persons to safe places before the system enters the continental zone. "We have to do everything now. We would not spend air bridges to assist the population, hence the need to pre-position all the necessary material" said Machatine. Mozambique is prone to flooding and it is especially vulnerable after a major drought last year as soils degraded or hardened by dry spells do not easily absorb water.